2009/10 - Wisla Plock S.A.
14.03.2012 - THW starts Last 16 of the VELUX EHF Champions League with a clear 36:24 victory in Plock. 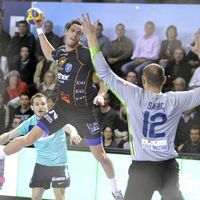 12.03.2012 - Last 16 clash between Wisla Plock versus THW Kiel is to be shown live on ehfTV.com with match commentary in German. 12.03.2012 - Kiel and Plock have worked together for the good of the sport many times but now face each other in the Last 16.